Subrosa Magnum Bash Guard Sprockets are in stock now and ready to ship! Subrosa Magnum bash guard sprockets are an extra thick, full guard, bash sprocket. Click HERE to view current size and color options. Sizes 25t or 28t. Colors: black, 69K gold, polished silver, and red/black fade. This sprocket features a split 5-spoke design with fully integrated sprocket guard to protect the teeth and chain from damage caused by certain grinds. 100% CNC Multilevel Design machined from 8mm thick, 7075 aluminum for maximum strength. Offset 1/8″ teeth for improved chain alignment and additional spacing to fit wide chains such as the Shadow Interlock V2 half link chain. Compatible with 1/8″ chains only. 15/16” bore. 19mm and 22mm adaptors included. Weight: 4 oz. for 25t. 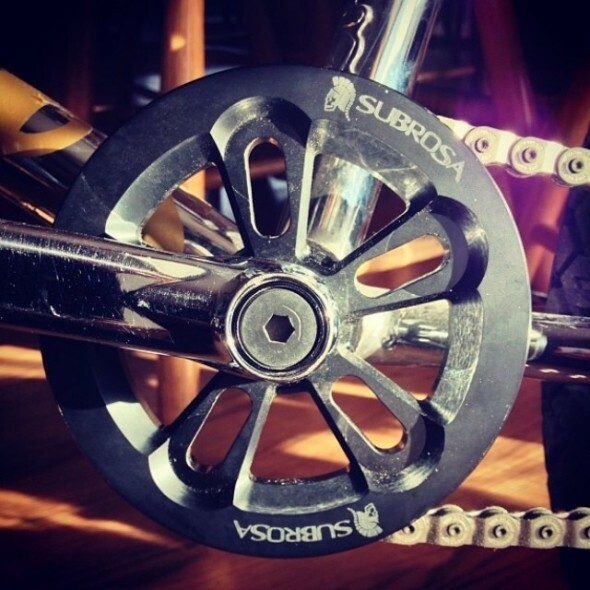 « Subrosa “Hold Tight” top load and front load stems for only $29.99 each – NEW COLORS!